This exhibition brings together two artists from different eras whose works reflect on modernity and technology. Early in the twentieth century, Moholy-Nagy claimed that: “The reality of our century is technology: the invention, construction, and maintenance of machines. To be a user of machines is to be of the spirit of this century. Everyone is equal before the machine.” These prescient ideas have taken on new implications in the digital realities of the twenty-first century. 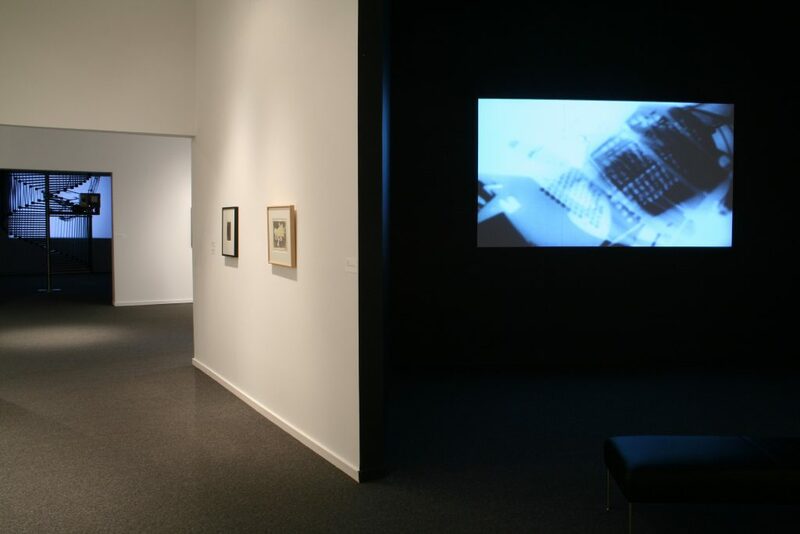 The film projections that are featured in this exhibition reveal how the mechanical eye of the camera creates a unique form of seeing. The exhibition offers reflections on the social impact of twentieth-century machine culture. Running continuously in the gallery will be the 1930 film Ein Lichtspiel schwarz weiss grau , based on Moholy’s kinetic sculpture, Light Prop for an Electric Stage. 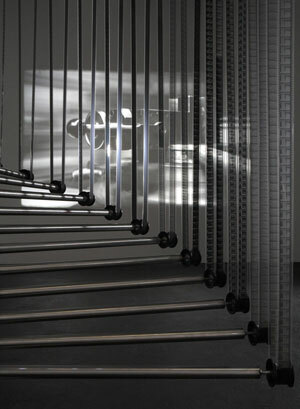 The film documents the play of light and shadow created by the mechanistic movements of the sculpture. 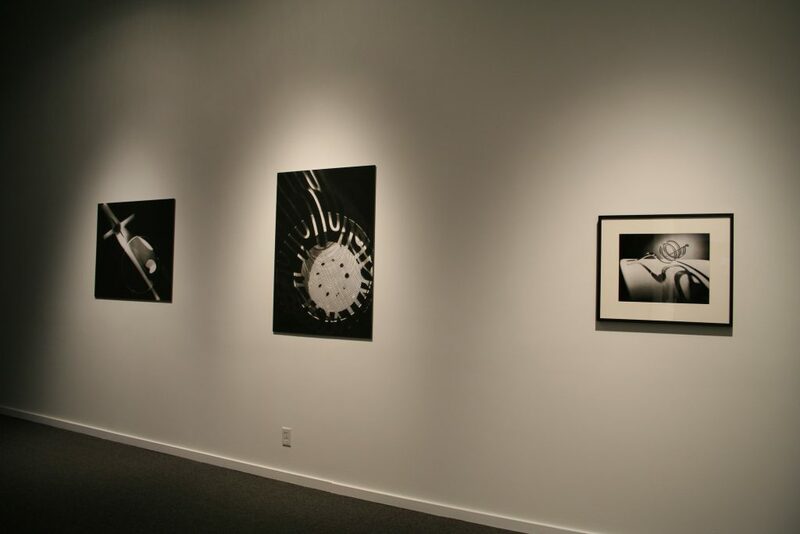 Similar to the abstract effects in his photograms, this black and white film light is an investigation of light as material and transparent form. The exhibition also marks the North American premiere of a new installation by the distinguished British artist, Simon Starling. Born in 1967 in Epsom, England and a graduate of the Glasgow School of Art, this multimedia artist has quickly risen to international prominence. 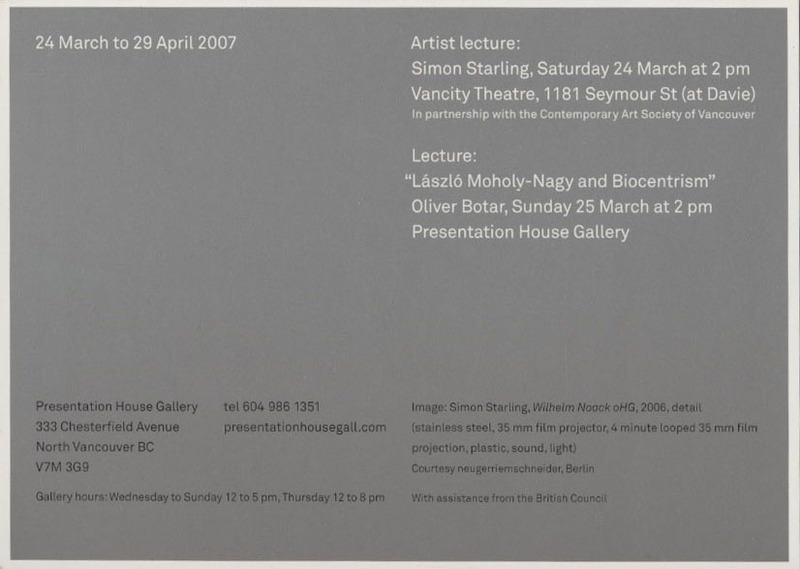 Winner of the coveted Turner Prize in 2005, he has exhibited widely and now, at Presentation House Gallery, for the first time in Canada. Starling has described his artwork as a “physical manifestation of a thought process” that often involves transforming objects into new constructions through handmade production processes. 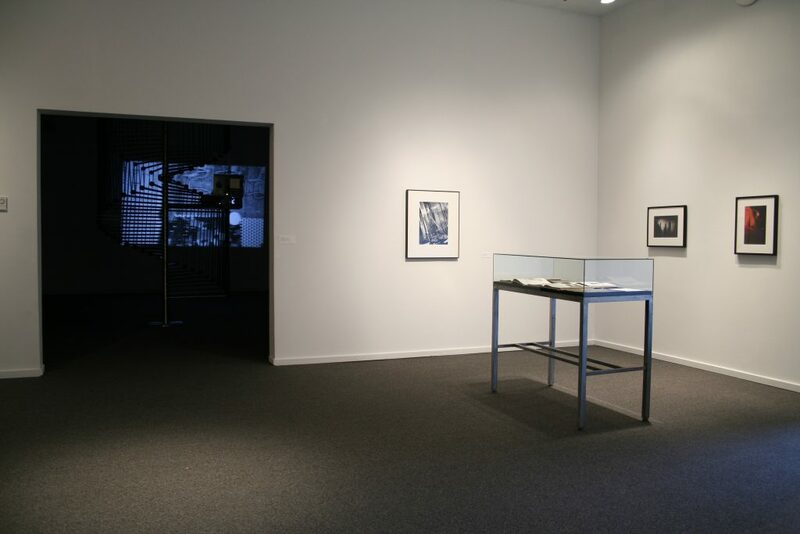 The mixed media installation featured at PHG highlights this concern for mechanized and handmade production, and physical materials as histories of place. Produced in collaboration with the Berlin metal manufacturing firm referred to in the title, Wilhelm Noack oHG is a 35 mm., black and white film projection and projector construction. The relationship between the footage of the workshop with sounds of clanging metal and the endlessly looping projection apparatus are intertwined. Related to Starling’s interest in icons of the modern, this work is a poetic reflection on a type of industrial production that is rapidly disappearing. Born in Borsad in Southern Hungary in 1895, Laszlo Moholy-Nagy was an influential Bauhaus figure in Weimar Germany, who lived throughout Europe until emigrating to the U.S. to become director of the Design School in Chicago in 1937 where he continued to produce innovative projects until his death in 1946. Considered one of the most inventive artists of the early twentieth century, he worked in various mediums including painting, sculpture, film and photography. He was also a graphic and stage designer, and an influential writer and teacher who published extensively. 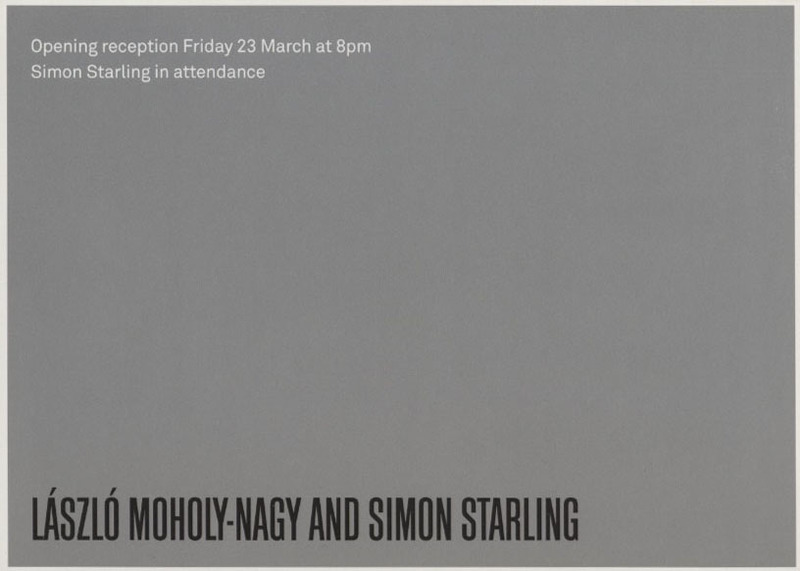 Moholy’s prescient theories about perception, technology and modernity have become increasingly relevant. 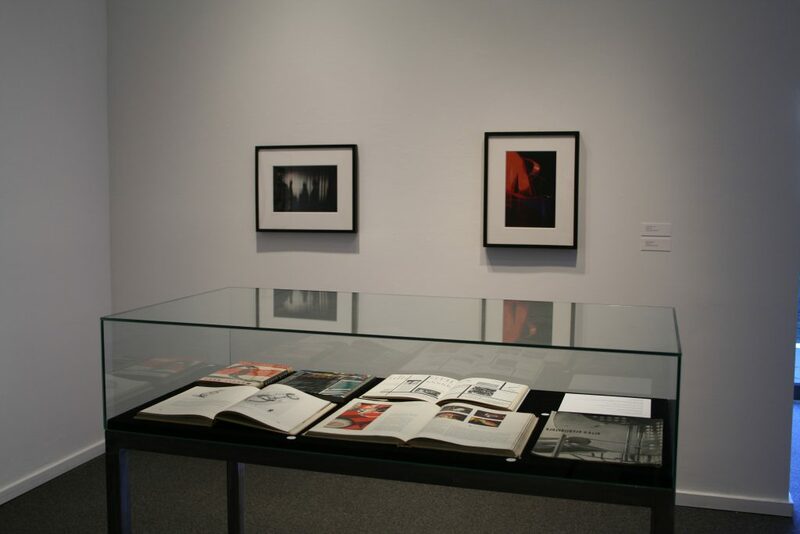 Exhibitions and publications on his artwork abound, most recently Colour in Transparency at the Bauhaus- Archiv, Berlin, the internationally touring exhibition Albers and Moholy-Nagy: From the Bauhaus to the New World and Technical Detours: the Early Moholy-Nagy Reconsidered curated by Oliver Botar.